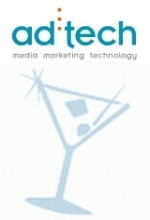 Four times a year Adrants, along with MarketingVOX, produces the ad:tech weblog, a site that provides in-depth coverage of the ad:tech conferences. During each show, we report on topics discussed during conference panels and keynote speeches along with memes and trends that arise from the show. We also walk the exhibit hall floor to discover the latest and greatest the industry has to offer as well as scour the party scene to see who's hip and who isn't. It's a fun gig and we like to share the fun. We're looking for a few well-versed people in the ad industry who'd like to join our team to cover the ad:tech show in San Francisco April 24-26. ad:tech focuses on interactive and online marketing so you should have a good understanding of that space and be able to write intelligently about it as well as offer opinion and insight. If you already write or blog about the industry, that's a plus. The compensation isn't stellar. In fact, there really isn't any to be honest other than free entry to the conference (about $1,000 depending upon when you sign up) and the chance to schmooze with the industry's best. Oh, and then there's the parties. So, if you're interested in joining the team, please contact me, Steve Hall at adtech@adrants.com. ad:tech San Francisco is on the way. Yes, we go. Yes, we promote it. This year ad:tech is hosting a newer, bigger, better Awards Show. The biggest yet, the event will judge work in 24 categories from best B to B website to best campaign optimization to best mobile campaign to best overlay ad to best consumer campaign and more. Finalists include AKQA, T3, Mullen, Sharpe Partners, Deep Focus, Ogilvy, Draft/FCB, R/GA, Spacedog and others. The judging will be done by 80 members of the advertising community along with an executive panel of 16 including FedEx's Steve Pacheco, Denuo's Scott Witt, Organic's Mark Kingdon and Real Girls Media Network's Kate Everett-Thorpe. And that's just the formal stuff.